We are pleased to welcome as a Corporate Member Liam Alistair Carrington-Morris of the Voice Magazine. 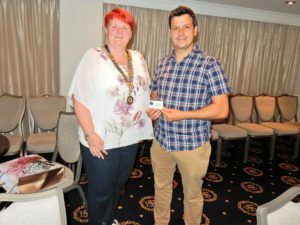 The photo shows Liam being inducted by our President Mandy Oldknow at today’s club meeting. 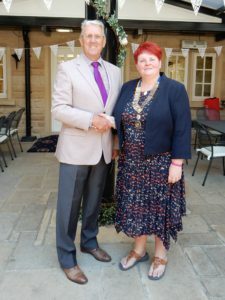 Mary Pearson from the charity Dukes Barn Trust attended the meeting and told us about Dukes Barn an Outdoor Education charity, based in Beeley it became a fully independent charity in its own right in 2000. They run day and residential courses in outdoor adventure, team building and problem solving for young people with a wide range of abilities. Their main focus is children with specific needs such as Autism, Aspergers Syndrome, Downs Syndrome, children with hearing and or sight impairment and those with physical disabilities including wheelchair users. They also run courses for primary and secondary school children and those from disadvantage backgrounds or poor inner city areas. A set charge is made for the courses however no child is refused a place due to lack of funds when their costs are met from a bursary fund, fund raising activities and donations. Money also needs to be found for the day today running and on going maintenance. 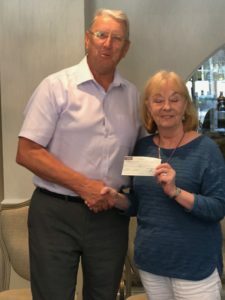 The photo shows Mary Pearson accepting a cheque for £250 on behalf of Dukes Barn from our President Dennis Fretwell. To help the homeless and vulnerable people (including homeless former soldiers) in the Midlands and in the UK starting ‘at home’ in Derbyshire bringing friendship, food, warm clothing, support, advice and hope for better times in the future. Emma told us that they distribute such items as sleeping bags, warm clothing, small 2 man tents, toiletry items and other essentials. Once a week in Derby they run a soup kitchen serving up to 250 hot meals and giving out up to 100 sandwich bags per session, some of their clients have not had a meal for 3 or 4 days. Our club members found the stories she told us of the many reasons that their are so many people homeless and sleeping rough in Derby disturbing. We were pleased to present a cheque for £250 to Emma and Andrew towards this good cause. 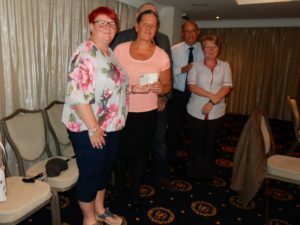 Also present at the meeting was David Reed the manager of Tesco’s Alfreton together with our Associate Member Julie Rossington also from Tesco. After the meeting both David and Julie had a conversation with Emma and Andrew. 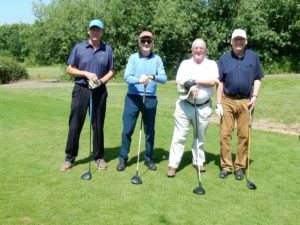 The Clubs annual Charity Golf Competition was held on Thursday the 7th of June at Ormonde Fields Golf Course, eleven teams entered raising £1111.00 for this years chosen charity Prostate Cancer UK. Thank you to all who took part on the day and to our sponsors. 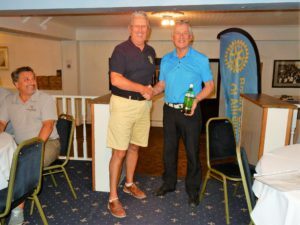 President Dennis Fretwell presenting John Shipman with his prize for the nearest pin. Kian Pearson a student at David Nieper Academy is preparing for an ambitions charity cycle ride. Kian’s goal is to set a new record to become the youngest person in the UK to do the John O’Groats to Land’s End (JOGLE) cycle ride in less than 20 days. 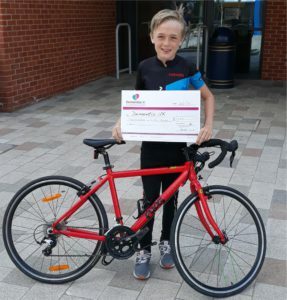 Kian who will be just 12 when he does the marathon cycle ride this July aims to complete the 998 mile journey accompanied by his father and uncle in 14 days in a bid to raise £10,000 sponsorship money for Dementia UK. Kian’s granddad recently passed away following a difficult battle with dementia, prompting Kian to help other people with the illness. To prepare for his cycle ride he is training at a local gym 6 days a week, as well as swimming regularly and doing practice rides from his home to Skegness. 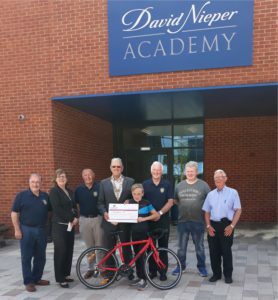 Our Club President together with other member’s this week paid a visit to the David Nieper Academy to hand a cheque for £250 to Kian for Dementia UK and to wish him well on his brave and ambitious charity ride. We successfully applied for a Rotary Foundation Grant for £1000. on behalf of Blackwell Community Primary and Nursery School to enable them to carry out work to upgrade their playground. Immediate Past President Roger Stevenson presenting a cheque for £1000. to the Headteacher Rachel Boswell. The Club have also presented the school with a frame for an Eco Greenhouse when the pupils have collected enough used plastic bottles we will assist in the erecting of the Greenhouse. The Murder Mystery Evening was a great success performed by the South Normanton Dramatic Society in front of an audience of some 80 persons sitting at tables of 10 endeavouring to solve the mystery of who had committed the murder. 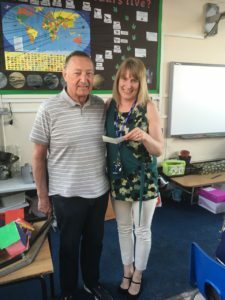 A prize was awarded to the table who solved the mystery together with a booby prize for the table furthest away from the answer. The evening raised £279.40 for local Rotary Charities. 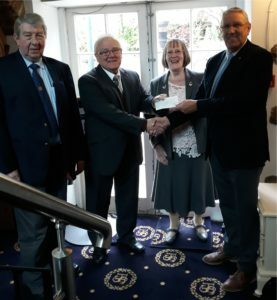 President Dennis Fretwell and Past President Jack Brown presenting a cheque for £250. to Brian and Elsie Mellors from the Riddings Park Community Charity. The main aims of the charity is to support local disabled groups, the local Brownies and to hold blood donor sessions. 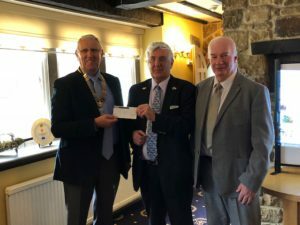 President Dennis Fretwell and Rotarian John Burch presenting a cheque for £250 being part of the clubs Santa collection to Chris Elkin representing Derbyshire, Leicestershire and Rutland Air Ambulance. Chris gave a short talk on the Air Ambulance service which was established in our area in 2008 based at the East Midland Airport. It is entirely supported by public donations and has carried out 30,000 missions since it’s beginning mainly to road traffic accidents and medical emergencies.